Online roulette is the easiest way to play the world’s oldest casino game. The odds, bets and gameplay are just the same as the tables at land-based casinos, but you don’t need to so much as set foot on the gaming floor. And at our trusted roulette casino sites, international players can safely play online. Unfortunately, this page is not relevant for Australians as online gambling is banned under the Interactive Gambling Amendment Bill 2016, effective as of September 2017. Microgaming French Roulette: As the largest and most respected casino software developer on the planet, it’s no surprise to see Microgaming topping this list. This is the only digital roulette game we know of which offers imprisonment rules and a house edge of 1.35 per cent on outside bets. What more could you ask for? NetEnt European Roulette Pro: The Professional Series roulette games provide a perfect example of why Net Entertainment is such a giant in the online gaming industry. The graphics and audio are faultless, the gameplay is silky smooth, and the customisable betting limits allow you to risk anything from $0.10 to $1000 per spin. Microgaming Multiwheel Roulette: Not satisfied with playing one wheel at a time? Neither were the folks over at MG, apparently. This unique multi-play European roulette game gives you the option to spin as many as eight wheels at once, which means you can win up to eight times on a single bet. Evolution Gaming Immersive Roulette Live: Live dealer roulette brings the casino floor to you, and nobody does it better than Evolution. The company’s whole range of live casino games is top drawer, but multiple camera angles, slow-motion replays and intimate production make Immersive Roulette the pick of the bunch. 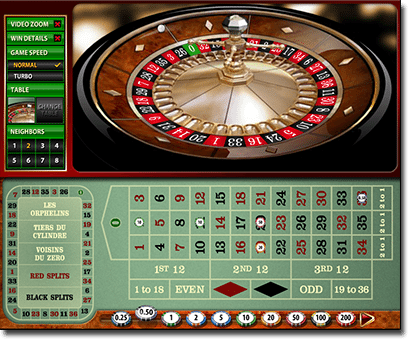 The game of roulette features three key components: the wheel, the ball and the betting layout. The wheel is evenly divided into either 37 or 38 numbered slots (depending on the specific variant), each of which corresponds to a panel on the betting layout. The numbers one to 36 are split evenly into red numbers and black numbers, while the zero (and the double zero, if used) are usually green. The game is controlled by a croupier, who spins the horizontal wheel and drops the ball onto the track. The player’s aim is to correctly predict which number, or which type of number, the ball will finish on. Players may place wagers on the layout up until the croupier declares “no more bets”. When the ball stops, the dealer will announce the result and pay out any winning bets according to the pay chart. Losing wagers are claimed by the house and removed from the layout. All roulette games feature two kinds of standard wager. One is the inside bet, which focuses on one or more individual numbers. The other is the outside bet, which covers large groups of numbers according to colour, type, range, or layout position. Inside bets pay better odds, but outside wagers are more likely to win. Straight up (35 to 1) – A wager on a single number. Place chips directly over the number. Split (17 to 1) – Two adjacent numbers on the layout. Place chips on the line between the two numbers. Street (11 to 1) – Three consecutive numbers in a single row. Place chips on the edge of the layout at the end of the row. Trio (11 to 1) – Any three of 0, 00, 1, 2 and 3. Place chips on the intersection between all three chosen numbers. Also called a basket bet. Corner (8 to 1) – Four adjacent numbers on the layout. Place chips on the intersection between all four chosen numbers. European top line (8 to 1) – A wager on 0, 1, 2 and 3. Place chips where 0 and 1 meet the edge of the layout. US top line (6 to 1) – A wager on 0, 00, 1, 2 and 3. Place chips where 0 and 1 meet the edge of the layout. Double street (5 to 1) – Six consecutive numbers in two adjacent rows. Place chips on the intersection where the two rows meet the edge of the layout. Also called a six line bet. Black or red (1 to 1) – Either all the red numbers or all the black numbers. Odd or even (1 to 1) – Either all the odds numbers or all the even numbers. 1-18 or 19-36 (1 to 1) – Either all the low numbers or all the high numbers. Dozens (2 to 1) – Either the first dozen, second dozen, or last dozen numbers. Columns (2 to 1) – Either the first, second, or third column of 12 numbers on the layout. Online roulette games or land-based casinos? Q: How do Internet roulette games differ from traditional tables at brick-and-mortar casinos? A: Not an awful lot. Unlike blackjack and its myriad incarnations and offshoots, the rules and forms of roulette are all but set in stone. So whether you play on the Web or at a land-based casino, the gameplay and the payouts will be the same. When you play real money roulette online, however, you get certain options which aren’t always available at b&m casinos. Some gambling venues only use double-zero American roulette tables; that’s never an issue online, where you can always find single-zero European games. Many top-ranked roulette sites also offer French roulette and quirky variants such as Spingo and Mini Roulette, which you certainly won’t chance upon at Crown or The Star. Above all, online roulette is more convenient. You don’t have to leave the house and trek into the city, and you don’t have to waste your precious bankroll on extortionate cab fares, overpriced drinks, or ludicrous casino ATM fees. You can play on your desktop, laptop, smartphone or tablet device, or even on your smart TV. In summary, online casinos allow you to play what you want, when you want, and how you want, without sacrificing game quality or payout odds in the slightest. We mentioned earlier that not all roulette wheels feature the same number of pockets. That’s because European roulette games use a single-zero layout in 37 numbers (0 and 1 to 36), while American roulette tables use a double-zero wheel with 38 (0, 00 and 1 to 36). The question is: which one is better value for money? The huxters and scammers of the North American frontier used to claim: “Double the zeroes means double the chances of winning!” What they didn’t mention was that it was the house, not the punters, whose odds improved. Even though the wheel is different, US roulette offers the same payouts as its trans-Atlantic cousin. More numbers means the chance of any one result occurring is slightly less than with a single-zero wheel, which gives the operator a greater advantage over the punters. Thus, the house edge in American roulette is 5.26 per cent, compared to 2.70 per cent in European roulette. You can get even better odds on a traditional French roulette game which uses la partage or en prison rules. These old-school conditions mitigate the effect of the ball hitting a zero on even money bets (black or red, odd or even, etc. ), cutting the house edge down to only 1.35 per cent. Are any online casinos hosted in Australia? Does being good at maths help when gambling? How many goals did Gary Ablett senior kick?